Property Size 3,144 sq. ft. The Lone Star Lodge is a four bedroom, four bath lodge located in the Bridger Teton National Forest. This home has a special character given its superb location, its striking views of the forest and surrounding mountains, as well as the frequent wildlife visits from the local deer, moose, and elk. The lodge is conveniently located just minutes away from Wilson and Grand Teton National Park, about an hour from the South entrance of Yellowstone National Park, and 15 minutes to the historic town of Jackson. Set in a truly serene location with convenient proximity to the national parks, our guests are given the exceptional opportunity to enjoy all the sites and activities Jackson Hole has to offer during their mountain retreat. This property offers ample living space with over 3,000 square feet, three common area rooms, a large open kitchen, an elevated deck with an eight person Jacuzzi, and an outdoor patio with a fire pit and seating area. The atmosphere of this spacious mountain retreat creates a truly distinguished alpine experience for its guests given the peaceful seclusion within the large surrounding trees, crisp mountain air, quiet ambience, and foraging wildlife. Lone Star Lodge is the perfect blend for those looking for convenience yet space and seclusion while visiting this stunning part of the world. The layout of the home provides an abundance of communal space to best enjoy the company of family and friends. The main gathering area has a river rock fireplace surrounded by leather couches, along with an HDTV and DVD home theater system. Large bay windows in this area offer up the most picture-perfect forest views in the house. Above the main gathering area, you’ll find the master loft, which features another leather sofa ideal for curling up with a book and a hot cup of tea. From the suite’s windows you can also take a peek through the spotting scope to observe some of the 335 species of birds that call the Bridger Teton Forest home. On the lower level you’ll find the media room stocked with board games, a Play Station 2, a karaoke machine, and a DVD player. The media room provides ample bedding and seating, making this room perfect for family fun or as a retreat for the kids. Bring the fun outside and really take in the forest on the elevated deck, which hosts an eight-person Jacuzzi, perfect for nighttime stargazing and relaxation. There is also a patio connected to the kitchen, providing a great location for BBQs and evening get-togethers. The spacious yard offers additional recreational space and is well-known for frequent critter visits. Master Suite - Located on the second level, the master bedroom offers an open floor plan as well as easy access to the deck and Jacuzzi. Bedrooms One & Two - Both bedrooms are located on the main level and are furnished with queen-sized beds. In each room you’ll find ample closet space and a dresser. These rooms share a full bathroom with dual vanities, a large mirror, and a door leading to each bedroom. Each wood-framed bed is made up with a lightweight down comforter. Media Room - The media room is located on the lower level, providing an additional communal area with plenty of seating and entertainment. The media room hosts a large leather couch and chair, as well as a gaming table. This large room features two sets of bunk beds suitable for both adults and children. A full-sized bed sits in the lower bunk while the top bunk is a twin. In addition to both sets of bunks, there is also an additional queen-sized bed, for a total of five beds. In addition, there is an attached full bath. Optional for an Additional Fee - Master Lock-Off - This home features an additional fifth bedroom and master bath with an impressive array of amenities. Please call or email for details. Kitchen & Dining - The renovated kitchen offers an open floor plan with plenty of counter space, ideal for cooking meals for the whole party. The kitchen is fully-equipped with the essentials as well as many extras such as wine storage, stylish serving platters, plates and utensils. The dining area boasts an antique dining set with a large table seating 12 and featuring natural wood chairs upholstered in suede. Exquisite forest views can be seen from the windows above the dining area. Moving dinner outside is easy with your choice between a charcoal or propane barbecue and outdoor seating easily accessible from the kitchen. The Lone Star Lodge is located within the Bridger Teton National Forest at the base of Teton Pass (US 22) in Wilson, Wyoming. 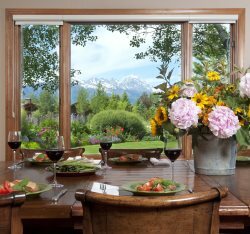 Situated 12 miles from downtown Jackson Hole, 12 miles from Grand Teton National Park and 65 miles from Yellowstone, this home is conveniently located, creating a balanced blend between serene seclusion and easy access to everything Jackson Hole has to offer. When you’re ready to hit the trail and explore Jackson Hole, you’ll find the area is scattered with numerous mountain biking and hiking trails with the added bonus of a mountain bike rental shop within walking distance. Dining out in the Jackson Hole area is an adventure in and of itself. Grab dinner and show at the Bar J Chuckwagon or Jackson Hole Playhouse, enjoy live music and sit with the locals at the Silver Dollar Bar and Grill, or treat yourself to a “Big Pig” margarita with your Chimichanga at Merry Piglets Mexican Grille. Jackson Lodging provides some essential items you may need for your stay. We place linens and terry in the unit, which are washed with Green Seal-certified detergents. Toiletries (shampoo, conditioner, lotion, mouthwash, a grooming kit, toilet paper, and Kleenex), dish soap, sponges, trash bags, etc., are provided for your use at no additional charge. Kitchen amenities, other than coffee filters, are not provided. There may be items such as spices, ketchup, salt, and cooking oil at the property that have been left from previous guests. This cabin is cleaned with Green Seal-certified products for your health and the environment. Firewood is also provided for this property. Beautifully appointed & furnished. We spent a memorable week on a 3 generation family getaway at this house and loved it. It's proximity to Wilson and Jackson Hole made it very convenient to buy supplies and head out to the Tetons! The layout of the house for perfect for your group as the teenagers had the downstairs (bunk beds, entertainment center) to themselves, and I stayed on the second floor and could use the hot tub early in the morning - what a great way to start the day!!! The kitchen was very well equipped and the size of the dining room table allowed us not only to eat there, but to use it to play games in the evenings. I found the owners/managers to be very responsive and gave me local intelligence on what to do/where to go which added greatly to our overall experience. Wonderful Week at Lone Star. We had a wonderful week at Lone star. We traveled to Wyoming by car so that we could see the country. My husband, daughter and I arrived in the afternoon on Saturday. We picked up three young adult boys including my son at the airport later in the afternoon. We came home, got settled in and cooked dinner. The boys moved into the downstairs area which had large bunk beds, good music and a flat screenTV. My husband and I took the master bedroom on the top floor and our daughter took one of the bedrooms on the main floor. We were all happy with our accommodations. The three bedrooms in the main part of the house were furnished in a comfortable and charming way. A couple of days later we had some of our friends join us. They set up in the second bedroom on the main floor and their son joined the other boys in the downstairs area. We cooked great meals in the kitchen. It accommodated all of us. We cooked every night. It was a pleasure to have access to a kitchen that was well stocked. One of our favorite things was sitting down to dinner at the table. It was big enough to accommodate all of us. We spent every evening talking around the table. In the evenings we went to the upstairs deck got in the hot tub and watched the stars. The evenings were beautiful. All of us used the hot tub and enjoyed sitting on the deck. We saw so many animals over the week. In our neighborhood we saw moose, deer and a number of different kinds of birds. We all walked into Wilson for numerous things. The town of Wilson had so much charm and the kids loved taking a stroll into the village. The Grand Teton national park was close by. We went hiking all over the park. It was amazing. We also went rafting and to the rodeo in Jackson. One day was also spent in Yellowstone which was about an hour and a half drive from the house. We had one of our best vacations at Lone Star. The house was welcoming, comfortable and you could tell the owners cared about it. We would go back to stay in a flash! Fantastic Week At Lone Star Lodge. My wife and I , along with three other couples, just spent a fabulous week at the Lone Star Lodge in Wilson. The Lodge was everything we had hoped for and expected. There was plenty of room for the eight of us and we still had four bunk beds left over. The house is big enough to provide ample privacy when needed, cozy private areas for reading, or the large dinning and common areas when everyone is having evening cocktails and re-hashing all the days activities. Oh, and the hot tub is wonderful and roomy enough for everyone. The town of Wilson proved to be a perfect location for any excursion. Nora"s and Pearl Street Bagels are a must do in Wilson. Teton Village is about 10 minutes away and then the road is wide open to Grand Teton Park and of course, Yellowstone. Jackson is five miles away and every recommendation we got from the Lone Star owner proved to be perfect. Don't miss eating at Snake River Grill, Rendevous and The Rusty Parrot to name a few. Also, the Mangy Moose in Teton Village and Dornan's in the "town" of Moose were very good with great mountain views. Overall, I would rate our vacation an A+. The Lone Star Lodge was excellent and we do plan to stay there again in the future. I have already recommended it to several friends. Max and Nancy, Atlanta, Ga.
Great Fall Get Away. Wonderful get away. The house is gorgeous and well maintained . Very quite and peaceful retreat. Great location - only a short drive to Historic downtown Jackson Hole and a short drive to Teton village, ski resort and Teton National Forest. House is also located not far from the Idaho border and about an hour drive to Grand Targhee Ski Resort. Wonderful restaurants nearby --- Strongly recommend Nora's --- less than a 3 minute drive from the house. Would stay at this property again in a heartbeat. Totally love the house --- love the location. Fantastic House in Wilson! My rating is way above excellent, really. This is a beautiful house and an incredible area! I came with my family of five (my husband and three kids 6-10), and my sister came with her kids (13-17), and we had a wonderful week. The house itself is amazing -- spacious and conveniently located just up the hill from Wilson and a terrific coffee/bagel shop. It is also full of amenities including a hot tub and a very kid (and adult) friendly lower level, with bunks, a wall-mounted flat screen TV, and an entertainment system. The house also has Wi-fi, which proved very useful in helping us decide where to spend our days. Despite all the great parts of the house, we didn't spend much time there, however, because of the myriad outdoor opportunities that staying at this house provided. We drove up to experience the geysers and wildlife of Yellowstone one day, we spent a few other days exploring the Tetons (the Tram up above Teton Village, hiking around Jenny Lake and up to Hidden Falls and Inspiration point, trekking all around), we went white water rafting on the Snake River, horse-back riding along the same, and we drove around many back roads to see the wildlife, including bison, deer of all kinds, and even a black red fox! This was one of the best vacations my family has ever had, and there is so much we still did not have time to see. We would come back to stay in this house in a heartbeat. The Lone Star Lodge was the perfect Jackson Hole rental. There were just 2 of us for a week and even though the home is large the layout was just right. The vaulted ceilings were stunning and the fireplace was wonderful. We saw a few Deer right in our yard! We couldn't believe how private and secluded this home was for being so close to Wilson. We have already recommended this home to all our friends and want to stay here next year on our annual visit. Urgencies: If you are experiencing an urgent issue, please call our office number first at (307) 734-2404. If lodging-related and it can't wait until business hours, please call our after hours number at (307) 690-3806. For emergencies, call 911 if appropriate.